Good. 0091816971 ALL BOOKS SHIPPED WITHIN 1 DAY OF PURCHASE! A good condition dust jacket is present. First edition. The cover is clear of stains and marking. The hinges are in good condition. The page edges are clean. The text to the spine is clear and bright. Books by Spencer Johnson, M.D. Who Moved My Cheese? for Kids: An A-Mazing Way to Change and Win! This book talks about the difficulties we all have with change and presents a new perspective with a group of lovable characters! EXcellent! Hihly recommended. We are using this in our bible Study. Get Up and Move! Get out of the problem and get into the SOLUTION!!!! Better than what I thought! Read this book already! Got it for a friend. The book was in great condition as well. OMGoosh! I am in transition right now, and I just left one of my group meetings called "Jump Start" in Richardson, Tx. 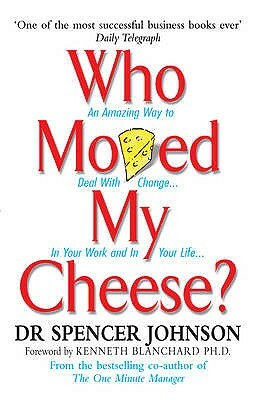 The key note speaker Jack Howe spoke on this book, and as he spoke, he touched my inner-soul of awareness for change!! Thanks, Katherine for inviting Mr. Howe! We must have Jack back soon! The Lord will be bless him and his business abundantly, soon!! At first I thought this was a children's book, but discovered it wasn't. It was very helpful and I expect to read it again. I liked it so much that I ordered the one for teens to give to my Granddaughter.